As seen in Mapa’s recent Australian Mobile Banking Dashboard, biometric technology is an area of increased focus, development and differentiation among banks in Australia and around the world. Bank of Melbourne/St George was the first major Australian deposit taker to introduce biometric security to its banking app, in the form of fingerprint scanning on equipped iPhones. However, for the first time one, of the market’s big four banks (ANZ, Commonwealth, Westpac and NAB) has sought to introduce the technology to its offering. Westpac, one of Australia’s oldest banks and, via the Westpac Group, owner of Bank of Melbourne/St George, recently announced that the security technology would come into effect by the end of January, allowing its customers to access online banking services using Touch ID. The launch of the fingerprint-scanning technology is followed by the introduction of Westpac Live in early 2014. Westpac Live, which was ranked Best Innovative Online Banking Service in Money Magazine’s 2015 Best of the Best Innovation awards, includes features such as real-time running balance, the ability to share your online banking with others and enhanced self-service. Westpac also announced that it will be making further additions and enhancements to Westpac Live early in 2015, including the ability for users to share access to their account with others, and view accounts in a foreign currency. 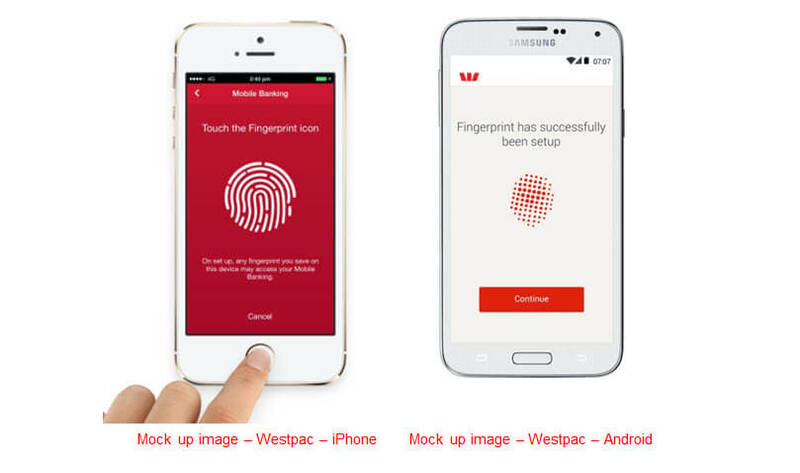 Despite other banks introducing the biometric security feature on iOS devices, Westpac is the first international bank to offer fingerprint access through Samsung Android devices. Westpac head of digital, Harry Wendt, confirmed customers would have a choice of using online access codes, a four digit PIN or, from January, a fingerprint to log in to their mobile banking account. Mr Wendt also stressed “that the bank would not hold the fingerprint data, but instead that information would be encrypted on the smartphone itself”. Westpac’s retail group executive also pointed out that over half of the bank’s digitally active customers are using mobile banking and said customers were processing more than AU$50 billion worth of transactions each year. Big four competitors NAB and ANZ are thought to be trialling other biometric technologies; however, no firm release date has been put forward by either institution. In the US, USAA announced that its customers will be able to use biometric authentication to log in to their accounts on their smartphone early 2015. USAA stated “facial recognition will require users to look at the screen and, when prompted, blink their eyes”. Other technologies such as voice recognition are becoming more widely available across Europe, with ING in Holland using voice recognition for balance and transfer requests within the mobile app. This gradual evolution will continue further than just biometric authentication for payments on Apple devices, as exemplified with Westpac’s push to introduce fingerprint access in Android devices.